We have reached the top of the Billfish Report’s Top Billfisheries of 2009, and coming in at #1 is the Great Barrier Reef, Australia. A beautiful black marlin not enjoying his lunch. Courtesy Capt Bill Billson. The reef is a world-renowned fishery, inarguably amongst the world’s best year-in and year-out. Ask any international angler or captain and Australia will always be counted among the top billfisheries in the world. And whilst this fishery, like any other, has its hot and cold years (last year was an absolutely cold one, by its standards), there is positively no better place on earth to catch a grander (1,000-pound) marlin. Some 70% of all granders caught in the last 50 years have been caught in this 150-mile stretch of water between Cairns and Lizard Island. On average, the fishery sees between one and two granders per week in its season that lasts about 10 weeks – mid-September through the end of November. The reef is primarily a bait fishery, though recent years have seen more boats trying out lures wide of the reef. Captains typically pull two or three baits, usually dead whole mackerel and ideally a live yellowfin, with scad being a popular choice amongst Cairns captains as well. Astonishingly, yellowfin BAITFISH can go to 30-35 pounds, with skipbaits preferred to be in the 10-15 pound range. 2009 was just simply stunning on the reef. Get this – according to the Billfish Report’s count, there were 12 granders caught in the world in 2009 outside of Australian waters. In the 10 weeks of heavy tackle season, the reef saw 36 granders. 36! There were also very healthy numbers of medium-sized fish (500-800 pounds) as well. Estimated 1000-pound black marlin caught on Capt Ross Finlayson’s Top Shot. Courtesy Ross Finlayson. 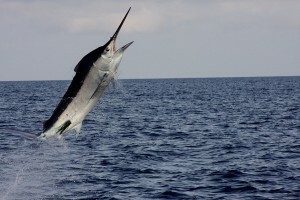 – There were some 110+ black marlin caught and released that weighed more than 800 pounds over the course of 2009. This included the 36 granders, 37 that went over 900, and an additional 37 that went over 800. – The Lizard Island tournament, the most prestigious black marlin tournament in the world, had 26 boats participating – with 125 black marlin caught in seven days, including 10 1,000+-pound marlin. 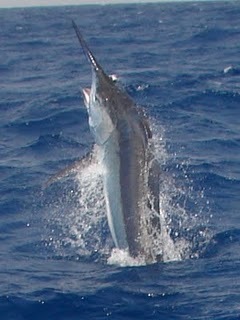 An athletic black marlin, one of 125 caught during the Lizard Island tournament in late October. Courtesy Australian Fishing Expeditions. – Several boats had epic seasons…the Kekoa saw several granders, including a 1,200+ fish…the Viking II caught five granders on the season, including two in one day – likely the best day on the water for any boat in the year…and our good friend Capt Barry Cross caught several huge fish, three granders, two over the 1,100 mark. Fishing surely can’t get much better than this. 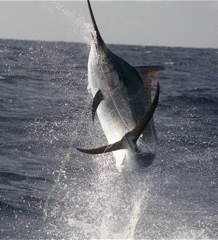 Congratulations to NE Australia, the Billfish Report’s #1 Billfishery of 2009. Nice layout just read every one of them I like how you guys put them together. Might have a chance to get down to Australia this year!! Jason – You going to mate down there?